Learn all about the BIO-S Project! 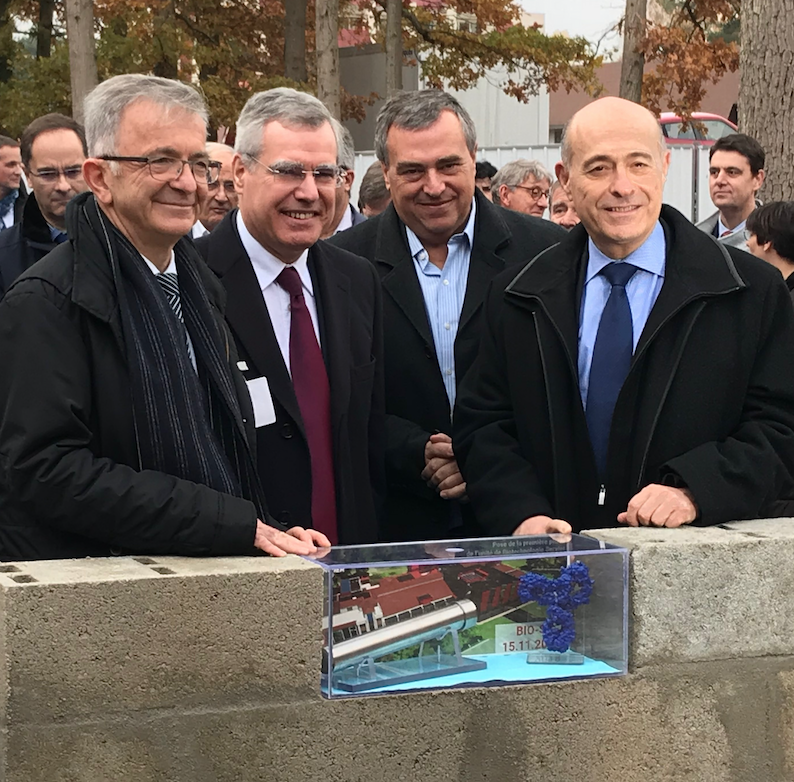 Paris, France – 15 November 2018 – Servier, an independent international pharmaceutical company, announces today the laying of the first stone for the future bioproduction unit at the Gidy industrial site (Loiret, France). Called Bio-S, the unit will produce active ingredients and drugs derived from living cells, which are manufactured using biotechnology techniques. The ceremony was attended by Olivier Laureau, President of Servier, François Bonneau, President of the Centre-Val de Loire Region and Jean-Marc Falcone, Prefect of the Centre-Val de Loire Region, Prefect of Loiret. In response to the importance of therapeutic advances made by biomedicines in the treatment of various pathologies, notably cancers, one of the Group’s priority areas, Servier has decided to develop bioproduction capacity at its French site in Gidy. Called Bio-S, the future unit, located in the renovated and refurbished premises of the current UP3 site at Gidy, will be responsible for the manufacture and packaging of monoclonal antibodies, initially in the form of preclinical batches, then clinical batches. With a surface area of more than 3000 m², the Bio-S unit will assemble various activities, including a development workshop dedicated to monoclonal antibody processes (Bio-engineering) which will be operational by 2019. The rest of the unit, grouping all the steps to deliver an injectable product to humans, will be operational in 2020. The result of an investment of 50 million euros over 3 years, as well as regional, national, and European research and development grants, Bio-S is a project jointly led by the R&D and Industry teams of Servier. At its launch, Bio-S will have around 30 employees and around 60 employees by 2022. The installation of a biomanufacturing unit in Gidy is being made possible by the immediate proximity, within a single site, of teams dedicated to the industry and teams specialized in Research and Development. The Bio-S unit will also benefit from the regional ecosystem. The Centre-Val de Loire region is recognized as a hub of excellence in the pharmaceutical industry, composed of numerous experts and training centers in this field. “This new activity involves new skills. For this, we will recruit staff, while simultaneously promoting the training of employees through development plans and degree courses”, commented Patrice Martin, Manager of the Gidy site. “The Centre-Val de Loire Region, which has a long history of developing biotechnology, is one of the most dynamic in this field. Therefore, this is the ideal environment for the launch of our activity. To train our employees in this new business, we will be able to rely on regional players of choice such as the University of Tours or the IMT Group”. Gidy is the largest of Servier’s 16 production sites worldwide. Built in 1972, in a wooded park of 60 hectares, the site has 3 production units, employing 800 people and exporting 77% of its production to 134 countries.